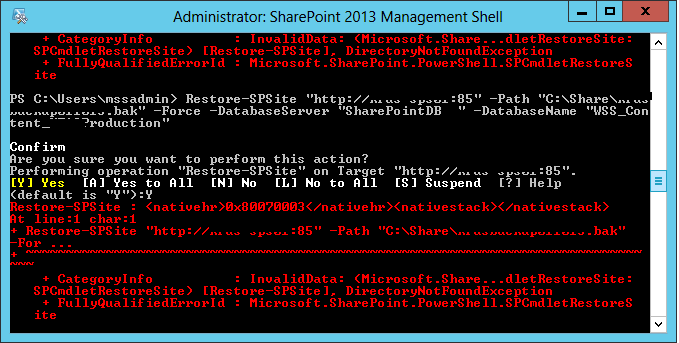 When you try to execute a SharePoint Online PowerShell command you may come across the above error. Its due to some privacy settings in your local computer. These scripts could potentially harmful things that you will never expect. 🙂 By default the execution of the PowerShell scripts are disabled by Microsoft. As well as before executing a script you have to make sure that the script is from a reliable source. Restricted – No scripts can be run. 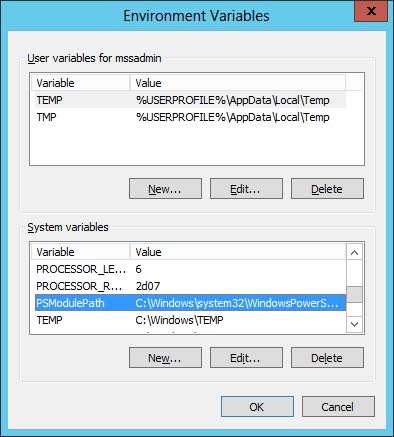 Windows PowerShell can be used only in interactive mode (This is the default). I had a site with variation for English and Arabic. I had no problem changing the language from Arabic to English and vice versa in our staging environment. For En and Ar subsite even was able to change the language without any issue. But in production environment the case was so strange. I can be able to change the language in subsites (ex: for en and ar subsites) but not for the root site. When i try to do so was getting the error “Alternate languages are not supported on sites with customized CSS files.” Tried on searching in log files and couldn’t find any clue to sort out this issue. One of the solution that i come across when searching was to delete the “_style” folder under root. I removed the folder and the situatoin was the same. I thought it was the problem with the Arabic Language pack. I tried repairing the Arabic Lanuage pack. Though it didnt work. Finally the solution is to remove the entry from the table “AllWebs” for the “CustomizedCSS” field for the root site. You will find 3 entries in this particular table for Root, English and Arabic Sites. When you check the CustomizedCSS for all these 3 records you will find some value for the root site record (in my case it was showing the ;#corei5; value) and for the other two you will find NULL value. Set the value for NULL for that. Once its done you can be able to change the language to Arabic without any issue. In a situation where you have to load CSS files based on the current culture, in this situation you have to use the ~language variable in SharePoint. This will retrieve the proper language ID(example for English-US: en-US, Arabic-SA: ar-SA). While you were working with SharePoint designer 2013 you might face a situation where you will popup with an error “The file is no longer checked out or has been deleted” at a time when you try to check in any of the file from SharePoint designer. I tried restarting the SharePoint designer, resetting the IIS and restarting the machine even. Finally it seems that need to clear the cache in local app storage to resolve the above error. Navigate to your local app settings cache folder located in the below location and delete the files corresponding to your site. Please follow below steps in moving the SharePoint database from one server to another. 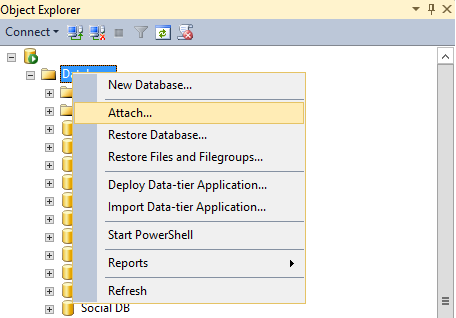 Deattach all your databases from SQL Server A. Move all the .mdf and .ldf file from SQL Server A to SQL Server B. Place them in the proper DATA folder on SQL Server B.
SQL Server A to be created on SQL Server B. Then attach the databases on SQL Server B. 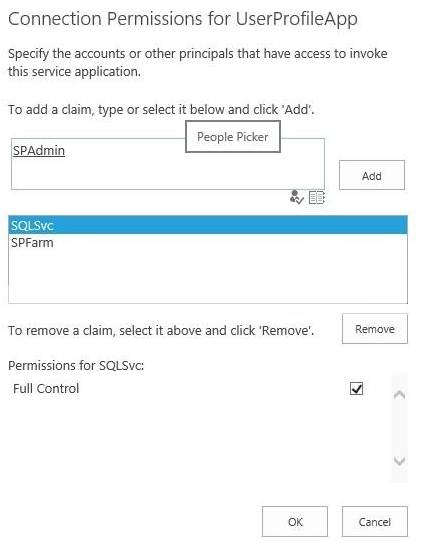 Modify the SQL alias on SharePoint that points SQL Server A to SQL Server B. RESTORE cannot operate on database ‘kiainternet01’ because it is configured for database mirroring. 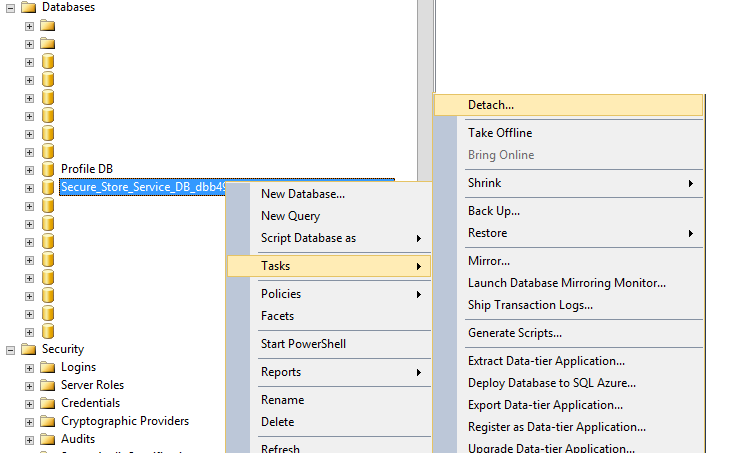 Use ALTER DATABASE to remove mirroring if you intend to restore the database. If you are working with a number of SQL Server instances or have really complex server/instance names, its good to use aliases with easy naming conventions. The same can be used to connect to SQL Server instancess. 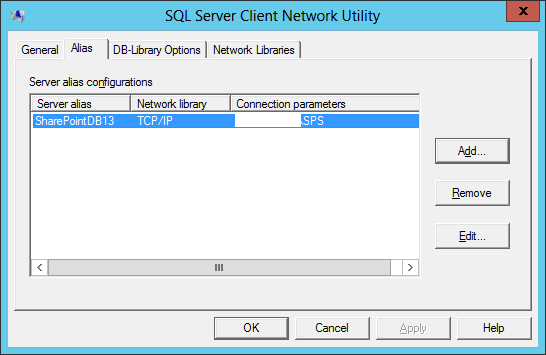 For you to create these aliases you can use the SQL Server Client Network utitily programs (cliconfg). Aliases would secure the real instance names of the SQL Server in any case if its exploited by an external hacker. Launch “cliconfg” by Start > Run > CliConfg. Then go to Alias tab and click the add button to add the alias. Output: SUCCESS: The scheduled task “\Microsoft\Windows\AppFabric\Customer Experience Improvement Program\Consolidator” has successfully been created. Error: ERROR: Invalid syntax. Default option is not allowed more than ‘2’ time(s). Error: Type “SETX /?” for usage. Output: SUCCESS: The scheduled task “\Microsoft\Windows\AppFabric\Customer Experience Improvement Program\Consolidator” was successfully deleted. based on the above error log could notice that ” is getting amended to the PSModulePath path. So for this what you have to do is to remove that ” from the PSModulePath enviornmentabl variable. Add the following code to hide the ribbon in Share Point 2013. Once you apply the above code snippet the vertical bar would be get hidden. For you to get the ribbon back, you have to over ride the style attribute of the body, so for that add the attribute to the style=”overflow: scroll !important” to the BODY element of your master page. Once you apply the same you will get the vertical scroll bar back. The reason behind this is that the master pages have a link to corev15.css. This stylesheet sets overflow to hidden for the BODY element, which removes the scroll bar. I was restoring a SharePoint site from a lab environment to Production. This is one of the frequently used powershell commands that we use in addition to the Backup-SPSite. Come on man, was worried to see the below error. So started to search on this error hence this is the first time I saw this error. Some posts says its related to managed path issue, advice us to check the managed path in both the environments. I checked, so in my case its nothing to do with the managed paths Hence the site had only one root site collection. In some post it says the SharePoint versions are different. I thought this might be correct hence in my lab environment it was the SharePoint enterprise version with the trial license. But in production it was the SharePoint Enterprise. Suddenly I thought of checking the SharePoint logs and the event viewer. I couldn’t see any specific error in the Share Point logs. 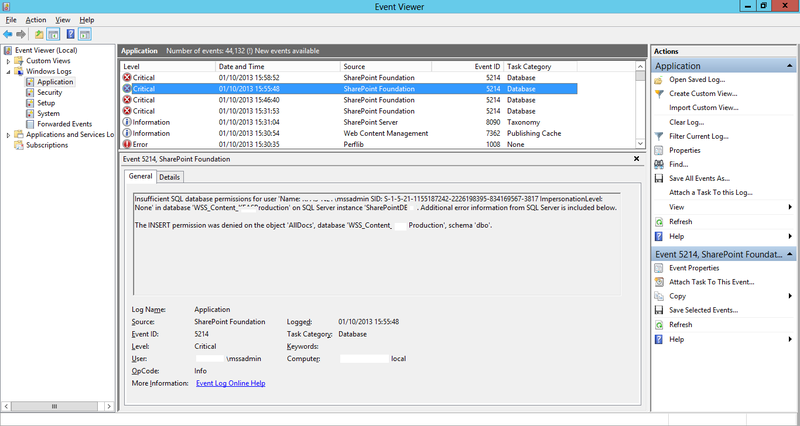 Then moved to check on the Event Viewer. Ohhhh man, it was something related to the login which I used to execute the power shell command “insufficient SQL Database permission for user named domainaame\username”.